We don't know about you, but we've always wanted to play the part of a James Bond villain. Or, at least have the cool swag that comes with being megalomaniacal. 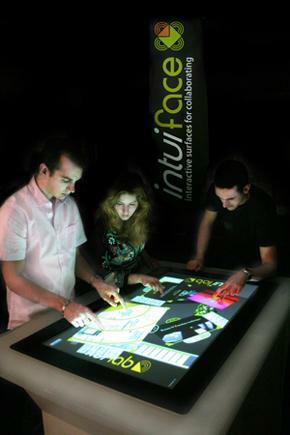 All I'd need right now is $20,000 to buy this IntuiFace table by IntuiLab. But you'll need to cough up another $50 or so next year to take advantage of it with Ubisoft's R.U.S.E.--an intriguing upcoming real-time strategy game. The fast-paced title takes you through World War II. To me, it looks like you're playing a high-speed, high-intensity version of Risk or Axis and Allies. (I like its twist of letting you earn special abilities like Radio Silence or Decoys for catching your opponent off-guard.) The big draw to this demo, though, is how you navigate and command units in the world. You're able to change the camera view to pull back to a large war-room overview or zoom down to a bale of hay on the battlefield. This is all done with multitouch sweeps and on-screen gestures drawing rings around units and sending them into battle. What was amazing is that there wasn't a single slowdown, not one break in the action while the test went on. Already, the game is looking gorgeous. Then again, if you're projecting it onto this super-expensive table, it had better look good. So, are they just making this game for the super-wealthy? No. According to the developer, the technology scales very nicely. Spokespeople anticipate the game working well on Tablet PCs that will be available when R.U.S.E. ships in early 2010. (The game is also being crafted for the Xbox 360 and PS3--no touchscreen interface there, of course).